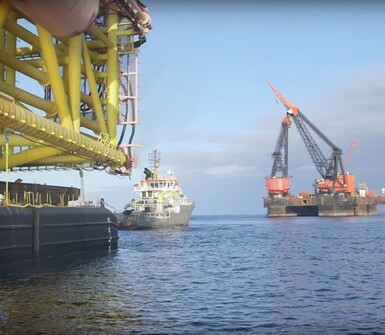 Seatools B.V. is proud to announce that not only the Jacket-Upending Monitoring System performed very well during the installation of the Gina Krog Jacket – also the visualized data provided new insights for Statoil & Partners and Heerema Fabrication Group. The jacket is the largest launch jacket ever built by the Vlissingen yard of Heerema Fabrication Group, with a height of 142 meters, a footprint of 60 x 50 meters and a weight of over 17,000 tons, including rigging and buoyancy tanks. The Jacket-Upending Monitoring System visualizes the flow and volume of water in the compartments of the jacket legs during the upending process of the jacket, as well as the resulting inclination. With this system, the Transport & Installation engineers were able to monitor and record in real time the physics of a jacket upending operation for the first time. This data provides feedback on the theoretical flow rates of air and water during the launch, and will now be used by Heerema to deepen their knowledge about this critical process.